All-in-one. Buy all our programs in this single package. Great value for money! WordPerfect Password is coming soon. The common file name extension of WordPerfect document files is .wpd. Older versions of WordPerfect also used file extensions .wp, .wp7, .wp6, .wp5, .wp4, and originally, no extension at all. Never lose your password again! 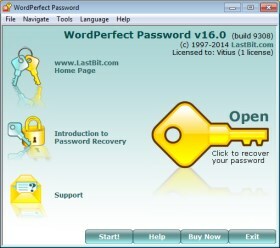 Award-winning, multi-user, powerful, versatile and feature-rich password manager. Sometimes people ask us why Demo versions of our software are so limited. Here is the answer. Password recovery tools are very special software. Unlike regular software, a typical password recovery tool may be needed only to restore that much needed document, and nothing more. You use it only once, as opposed to system-checking, workspace-improving or security software. Suppose we release a regular time-limited fully-functional trial version. In this case we will inevitably lose a lot of our customers ("one-time users"). Developing good password recovery software takes a lot of efforts from our professionals, so we simply wouldn't be able to stay in business if we gave our software away for free. We have to offer you software with limited capabilities so you can have a chance to evaluate them, and we have a chance to get paid for the full version and keep bringing you better products in the future. Your understanding is much appreciated; if you choose our products, you won't be disappointed by their performance and support! If you have any suggestions or ideas on improving our software, please let us know. We do appreciate your opinion! If you have any problem or question, feature request or inquiries, do not hesitate to contact us. Just send us email, and we'll get back to you as soon as possible. Also we really appreciate your comments and feedback. Copyright © 1997-2019 LastBit.com. All rights reserved.